Retailers with both e-commerce sites and traditional brick-and-mortar stores have their work cut out for them. “Omnichannel” is no longer a buzzword. Today, rather, it’s an expectation. According to Forrester Research, 71 percent of consumers now expect to view in-store inventory online while another 50 percent expect to buy products online and pick up in-store. The bad news is that most retailers are unable to deliver this experience. The good news is there are, of course, solutions that can. IBM, for example, helps retail clients like Macy’s and 1-800-Flowers deploy fulfillment solutions to deliver product when, where and how customers want them through its Smarter Commerce solutions and partners. 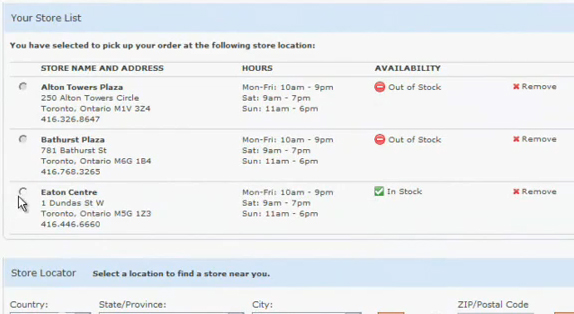 For example, Kohl’s is using IBM’s Sterling Order Management software to pilot a buy online, pick up in-store program at select U.S. locations (see screenshot below). Buy online and pick up in-store is a capability that half of consumers now expect, but is of course a complex fulfillment scenario for retailers. Adding to that complexity is a trend that Pete Wharton, IBM Commerce Product Marketing Manager says they are seeing in European marketers. This is where IBM comes in. Its solutions answer the question, “How can I fulfill that order?” Retailers wouldn’t want, for example, to fulfill that single order with items from various stores, as that not only delays pick-up time for the consumer, but also adds to operational costs if the business is transporting items back and forth. If a local store only has two of the items selected, but the next-nearest store has all four, retailers can give customers more options, enticing them to pick up items from another store that has all four items in stock. The alternative is for retailers to get all items in stock at the customer’s preferred store, and now there’s cost involved in doing so, according to Wharton. 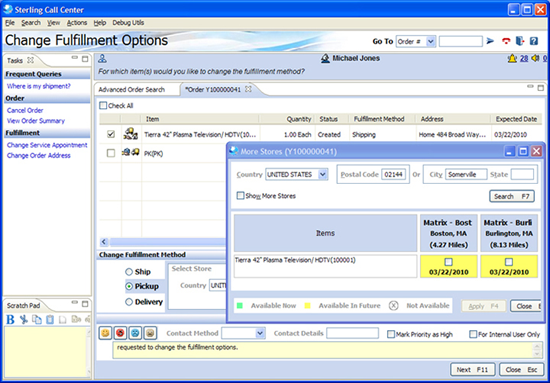 IBM allows the order orchestration process to give them options around fulfillment as they go through the order process (see the screenshot below of customer-facing inventory). What happens when consumers don’t want to drive around town to get their online orders? Thanks to Amazon, they may start expecting same-day delivery. While Amazon has warehouses across the country, it is still not as close to the end consumer as a retailer with a brick-and-mortar location is, however. By partnering with Deliv, a leader in same-day delivery software (which kind of works like Uber but for deliveries), IBM’s retail clients can quickly add this delivery option for any channel from online, mobile and call center (see screenshot below) to in-store checkout. These solutions allow retailers to mobilize their physical stores as strategic points of advantage with flexible fulfillment options, which positively impacts customer satisfaction, loyalty and brand perception while driving operational efficiencies. How retailers are fulfilling their orders from their store locations is a two-stage trend. The concept of a “dark store" (where consumers once shopped and now retailers just fulfill orders from) has been seen in the UK for quite some time now. Forward-stocking locations are becoming mini-dark stores (more stock and less store shelves). Wharton said The Gap talked about using its stores for this purpose around the peak of the holiday season. “We’ve had some retailers that actually make more profit and sell more products from their stock room than out on shelves,” said Wharton. With October nearing a close, most retailers won’t introduce anything that could impact profitability this holiday season, but all of these fulfillment trends mentioned here are certainly ones to watch in 2015.